Two diverse countries, one spectacular journey. 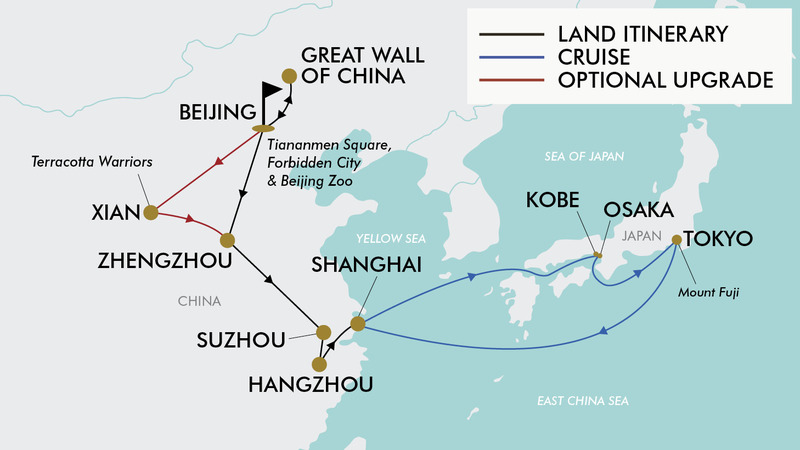 Discover the beauty and wonder of the Orient on this 19 day trip of China and Japan. Begin with the most famous sights of China, from the Great Wall to glittering Shanghai, and then set sail on an unforgettable cruise of the Japanese archipelago. Unravel the mysteries of Beijing with visits to Tiananmen Square and the ancient Forbidden City; view adorable giant pandas at the Beijing Zoo, home to an array of exotic animals; walk along the UNESCO listed Great Wall of China; enjoy free time in the fascinating city of Zhengzhou, of Shaolin Monk fame; take in the sights of Hangzhou’s West Lake on a scenic boat ride; step back in time at the vibrant Shanghai Museum and more. Then, embark on a seven-night cruise aboard the brand-new Spectrum of the Seas. This Quantum-class ship boasts a variety of innovations including the Bionic Bar staffed by robots, North Star elevated viewing platform, Sky Pad trampoline bungee experience and more. Sail the Japanese archipelago to the vibrant ports of Osaka, Kobe, and Yokohama (Tokyo). Package includes return international flights, 10 nights 4-star hotel accommodation, seven-night Royal Caribbean International cruise, English-speaking tour guides, 32 meals and more! Want to see more? Upgrade to the Xi’an package to witness the remarkable Terracotta Warriors. Today depart from Auckland for Beijing via Guangzhou, Shanghai, Chongqing, Chengdu, Qingdao, Xiamen, Shenzhen or Fuzhou. Fly with China Southern Airlines, China Eastern Airlines, Sichuan Airlines, Capital Airlines, Air China, Hainan Airlines or Xiamen Airlines (subject to availability). Upon arrival, a tour representative will meet you at the airport and then transfer you to check-in to the hotel. Please note: Due to flight scheduling and availability, some departures may occur on day 0. Affected customers must be at the airport the day before. Flight times will be indicated on your final documents at least 6 weeks prior to departure. After breakfast, your exploration of Beijing begins. Start with a visit to Tiananmen Square, one of the largest public squares in the world, followed by the Imperial Palace in the Forbidden City. The Forbidden City, officially as the Imperial Palace Museum, was originally constructed by Emperor Yong Le, the third Emperor of the Ming Dynasty. The palace was built between 1406 and 1420, but was burnt down, rebuilt, and renovated countless times, so most of the architecture you see today dates from the 1700s and onwards. Afterwards, visit a pearl factory to gain a little knowledge of fresh pearls. Tonight, take the opportunity to attend an optional large scale dramatic musical, “The Golden Mask Dynasty” (not included). After breakfast, set off to visit the Great Wall. En route, stop at a Jade Museum to learn the history of jade. In Chinese, jade is pronounced as “Yu” and it has a history in China of at least four thousand years. Observe the skilled artisans at work as they create their intricate designs. Afterwards, continue your journey with a drive through the scenic countryside and mountains to reach China’s most renowned monument—the Great Wall. You will visit the less-touristy and more original Juyong Pass, avoiding other sections which are the most accessible and consequently most crowded. The Great Wall meanders through China’s northern mountain ranges from the Yellow Sea to the Gobi Desert - a distance of more than 3500 miles. In the afternoon, take the opportunity to join an optional tour (not included) to explore Beijing’s 700 year old Hutongs (narrow lanes) by old fashioned pedicab. You will also visit a local family living in a courtyard-style home to experience the local customs, including a delicious home-cooked dinner. The optional tour also includes a visit to Shichahai - a historic scenic area comprised of three lakes - Qianhai, meaning Front Sea; Houhai, meaning Back Sea and Xihai, meaning West Sea) - as well as surrounding places of historic interest and scenic beauty, and remnants of old-style local residences. After breakfast visit the Beijing Zoo to see the giant pandas. Then make a stop at “Tongrentang” to learn more about traditional Chinese medicine. Afterwards, transfer to Beijing Railway Station for a high-speed train experience to Zhengzhou (approx. 3 hours). Upon arrival, you will be transferred to the hotel. This morning visit the Henan or Zhengzhou Museum (dependent on day of the week and closure periods), which are both major museums in China and were created for the collection, protection, study and display of cultural relics in the hinterland of the Central Plain. Then visit Erqi Memorial Tower. Erqi Memorial Tower is the memorial of the Erqi Strike, which occurred on February 7, 1923. The Erqi Memorial Tower has altogether 14 storeys, totalling 63m in height. Today enjoy a day at leisure, or take the opportunity to join an optional full-day Shaolin Kung Fu experience with lunch (not included). On the optional tour, visit the Shaolin Temple, the birthplace of Kung Fu and Zen Buddhism -nestled in the forested mountains of Henan. The Shaolin Temple embraces many exciting attractions, such as the Hall of Heavenly Kings (Tianwangdian), the Mahavira Hall (Daxiongbaodian), the Pagoda Forest, the Dharma Cave and the Shaolin Temple Martial Art Training Centre. Then continue your visit to the Pagoda Forest, where hundreds of stone pagodas - memorials to past monks - are tightly grouped together in the forest. You may also have the chance to watch an exciting Shaolin Kung Fu performance at the Martial Arts Hall and may follow the masters there to learn your Kung Fu here (subject to availability). This morning enjoy some free time at leisure before transferring to Zhengzhou Railway Station for a high-speed train to Suzhou (approx. 4.5 hours). Upon arrival you will be transferred to the hotel. Suzhou, which dates back to 514 BC, is sometimes called the ‘Venice of the East’. Today you will visit the famous Lingering Garden, recognised with other classical Suzhou gardens as a UNESCO World Heritage Site. China is renowned for its exquisite silk, so naturally a visit to the Silk Spinning Factory is in order. Take the opportunity to cruise along the Grand Canal (not included) to view life along China’s ancient waterway. Afterwards drive to Hangzhou (approx. 2 hours). Hangzhou is considered the tea capital of China, so a visit to the city just isn’t complete without a trip to a local tea house. Make a special visit to the Tea House at Meijiawu Tea Village located at the hinterland of West Lake Park which is considered one of the most important Longjing Tea productions in China. Enjoy the natural environment and beautiful village scenery while learning more about their special tea culture. At the Tea House, learn how to make the Longjing Tea including picking, frying and tasting the tea leaves. Then enjoy a small boat ride on the West Lake, another UNESCO World Heritage Site, which reveals the ethereal beauty of Hangzhou's willow draped islands. Next, drive to Shanghai (approx. 2 hours) to visit the famous Bund. Shanghai is divided by the Huang Pu River into eastern and western sections. Modern mega high rises are seen on the eastern side while traditional European style architecture may be seen on the western side. The Bund is a five-block riverfront promenade with many of Shanghai's banks and trading houses. Tonight there is an optional activity to watch a superb and thrilling Chinese Acrobatic Show “ERA: The Intersection of Time” (not included). This morning, step back in time at the Shanghai Museum - home to more than 120,000 objects and artworks. Enjoy some free time at leisure this afternoon or join an optional half-day tour of Shanghai (not included) including Yu Garden, believed to have been built in the Ming Dynasty, more than 400 years ago. The exquisite layout, beautiful scenery, and the artistic style of the garden architecture have made the garden one of the highlights of Shanghai. Other attractions include Xintiandi, Old Town and Nanjing Road. In the evening, take the opportunity to join the optional “Night Cruise on the Huangpu River” (not included). After breakfast, transfer to Port of Baoshan, where you will begin your 7 night Royal Caribbean cruise to Japan. Located on the Japanese island of Honshu, Osaka is known for its modern architecture, vibrant nightlife and hearty street food. The city’s most known landmark, the 16th-century shogunate Osaka Castle, is surrounded by a moat and a beautiful park filled with plum, peach and cherry-blossom trees. There are many other well-known landmarks in this city such as Sumiyoshi-taisha, Japan’s oldest Shinto shrines, Tsutenkaku Tower, the WTC Cosmotower, the Floating Garden Observatory and Tempozan, the world’s largest ferris wheel (entrances not included). For those interested in history, Osaka offers numerous museums (entrance not included) showcasing insight into this unique country. An overnight stop in port allows a great opportunity to experience Osaka’s nightlife and superb restaurants. Kobe is known for its scenic setting of mountains framing the harbour. With a population over 1.5 million people, Kobe has one of the biggest concentrations of foreign residents in Japan, which is reflected in its cosmopolitan atmosphere and collection of residences built in a distinctly non-Japanese style. Many Christian churches, Shinto and Buddhist temples and shrines, two famous statues of Buddha, a fine arts museum, and a municipal museum with a collection on Western cultural contact are amongst the highlights of this colourful city. The Ikuta Shrine, dating to the 3rd century, is among Japan’s oldest Shinto shrines. Antique cable cars connect Kobe to Mt. Rokko, which offers panoramic views over the port city. Beyond the Mount Rokko hills are the outdoor hot springs of Arima Onsen. An hour from the port city of Yokohama is the booming city of Tokyo, Japan’s busy capital which mixes the ultramodern and the traditional, from neon-lit skyscrapers to historic temples. The opulent Meiji Shinto Shrine is known for its towering gate and surrounding woods. The Imperial Palace sits amid large public gardens. The city’s many museums offer exhibits ranging from classical art (in the Tokyo National Museum) to a reconstructed kabuki theatre (in the Edo-Tokyo Museum). Be sure to experience a shopping mecca in the legendary Ginza district. Offshore excursions available today include a trip to the Meiji Shrine and the Senso-ji Temple (not included) or to Fuji-Hakone-Izu National Park for a boat trip on the lake, a cable car ride to Mount Komagatake and an unforgettable view of Mount Fuji (not included). Enjoy your final breakfast onboard before disembarking and making your own way to Shanghai Airport for your return flight back to New Zealand. Please note: Some flights may have an overnight stopover in Guangzhou, China, and complimentary stopover accommodation will be provided. Please note: due to flight scheduling some flights may arrive back in New Zealand +1 day. After breakfast, visit Beijing Zoo to see the giant pandas. Then make a stop at “Tongrentang” to learn more about traditional Chinese medicine. Afterwards, transfer to Beijing Railway Station for a high-speed train experience to Xi'an (approx. 5.5 hours). Upon arrival transfer to the hotel. The highlight today is a visit to the Terracotta Warriors and Horses Museum. Unearthed near Xi’an, the thousands of life-size sculptures of soldiers, chariots and horses are considered a world wonder. With different facial expressions and weaponry adorning each soldier, the Terracotta Warriors were believed to have been created to accompany the Qin Emperor into the afterlife. This site is among the top archaeological excavations of the 20th century. You will definitely be amazed by the scale of the Terracotta Warriors Army. Afterwards visit the Terracotta Warriors Reproduction Factory and then transfer to Xi'an Railway Station for a high speed train experience to Zhengzhou (approx. 2.5 hours). This morning visit the Henan or Zhengzhou Museum (dependent on day of the week and closure periods), which are both major museums in China and were created for the collection, protection, study and display of cultural relics in the hinterland of the Central Plain. Then visit Erqi Memorial Tower. Erqi Memorial Tower is the memorial of the Erqi Strike, which occurred on February 7, 1923. The Erqi Memorial Tower has altogether 14 storeys, totalling 63m in height. A winding staircase inside the tower brings you to the top floor, where you can get a bird’s-eye view of the whole city of Zhengzhou. Afterwards transfer to Zhengzhou Railway Station for a high-speed train experience to Suzhou (approx. 4.5 hours). Upon arrival transfer to the hotel. Hangzhou is considered the tea capital of China, so a visit to the city just isn’t complete without a trip to a local tea house. Make a special visit to the Tea House at Meijiawu Tea Village located at the hinterland of West Lake Park which is considered one of the most important Longjing Tea productions in China. Enjoy the natural environment and beautiful village scenery while learning more about their special tea culture. At the Tea House, learn how to make the Longjing Tea including picking, frying and tasting the tea leaves. Then enjoy a small boat ride on the West Lake another UNESCO World Heritage Site, which reveals the ethereal beauty of Hangzhou's willow draped islands. This morning, step back in time at the Shanghai Museum - home to more than 120,000 objects and artworks. Enjoy some free time at leisure this afternoon or join an optional half-day tour of Shanghai (not included) including Yu Garden, believed to have been built in the Ming Dynasty, more than 400 years ago. The exquisite layout, beautiful scenery, and the artistic style of the garden architecture have made the garden one of the highlights of Shanghai. Other attractions include Xintiandi, Old Town and Nanjing Road. In the evening, take the opportunity to join the optional “Night Cruise on the Huangpu River” (not included). Located on the Japanese island of Honshu, Osaka is known for its modern architecture, vibrant nightlife and hearty street food. The city’s most known landmark, the 16th-century shogunate Osaka Castle, is surrounded by a moat and a beautiful park filled with plum, peach and cherry-blossom trees. There are many other well-known landmarks in this city such as Sumiyoshi-taisha, Japan’s oldest Shinto shrines, Tsutenkaku Tower, the WTC Cosmotower, the Floating Garden Observatory and Tempozan, the world’s largest ferris wheel (entrances not included). For those interested in history, Osaka offers numerous museums (entrance not included) showcasing insight into this unique country. An overnight stop in port allows a great opportunity to experience Osaka’s nightlife and superb restaurants. An hour from the port city of Yokohama is the booming city of Tokyo, Japan’s busy capital which mixes the ultramodern and the traditional, from neon-lit skyscrapers to historic temples. The opulent Meiji Shinto Shrine is known for its towering gate and surrounding woods. The Imperial Palace sits amid large public gardens. The city’s many museums offer exhibits ranging from classical art (in the Tokyo National Museum) to a reconstructed kabuki theatre (in the Edo-Tokyo Museum). Be sure to experience a shopping mecca in the legendary Ginza district. Offshore excursions available today include a trip to the Meiji Shrine and the Senso-ji Temple (not included) or to Fuji-Hakone-Izu National Park for a boat trip on the lake, a cable car ride to Mount Komagatake and an unforgettable view of Mount Fuji (not included). A mandatory service fee is not included in the tour price, and is required for the services of the tour leader (when available) and driver throughout the tour. The mandatory service fee for the tour leader and driver is $13 NZD per person/per day where tour or transfer services are provided (day 1- 11), which will be collected whilst on tour (this will include day of arrival and departure, and covers both the tour leader and driver). Travel offer is valid for travel on the 24th of November 2019. China Southern Airlines, China Eastern Airlines, Sichuan Airlines, Capital Airlines, Air China, Hainan Airlines or Xiamen Airlines (subject to availability). - Mandatory service fee: $13 NZD per person/per day where tour or transfer services are provided (this includes day of arrival and departure). - Cruise: Gratuities are payable on additional items and services such as wines and spa treatments. China's weather in November is variable, as it is all year. Northern China will begin to see some cooler temperatures in late November but the beginning of the month can still be warm enough for pleasant outdoor activities. The climate will transit from autumn to winter in this month. The average low and high temperatures are respectively 8 °C and 19 °C ... Clothing: You may need a coat for the coolest weather; otherwise a sweater and a jacket are adequate for the evening. November means autumn in Japan, with the city's parks in Tokyo exploding with colour. The skies are typically brilliant blue, and the maple trees turn scarlet. It's cooler and drier, with average high temperatures around 17°C and much less precipitation. The best time of year to visit Japan! A mandatory service fee is not included in the tour price for services of the tour leader (when available) and driver throughout the tour. The mandatory service fee for the tour leader and driver is Y800 (approx. $11 NZD) per person per day, which will be collected whilst on tour. This covers both the tour leader and driver. Pre-paid gratuities onboard the cruise are included in the package price. Any optional extras purchased onboard the cruise will have up to an 18% gratuity added. A double entry tourist visa for China is a strict requirement if travelling on a New Zealand Passport. You will be able to start your visa application process once you receive your final travel documentation approximately 6 weeks prior to departure. Please start arranging your visa as soon as you receive your documentation to account for any delays due to consulate operating hours. A tourist visa for Japan is not required if traveling on a New Zealand Passport. Please note: Passengers who are not New Zealand citizens must check with the respective consulate or visa agency to determine what their visa requirements are and what personal identification is required. It is also important to note, some areas of employment such a journalism, government authorities and charity organisations may have additional restrictions in applying for Visas. This may in turn affect the type of application required.